March 15, 2006: NASA astronauts are going back to the moon and when they get there they may need quake-proof housing. That's the surprising conclusion of Clive R. Neal, associate professor of civil engineering and geological sciences at the University of Notre Dame after he and a team of 15 other planetary scientists reexamined Apollo data from the 1970s. "The moon is seismically active," he told a gathering of scientists at NASA's Lunar Exploration Analysis Group (LEAG) meeting in League City, Texas, last October. 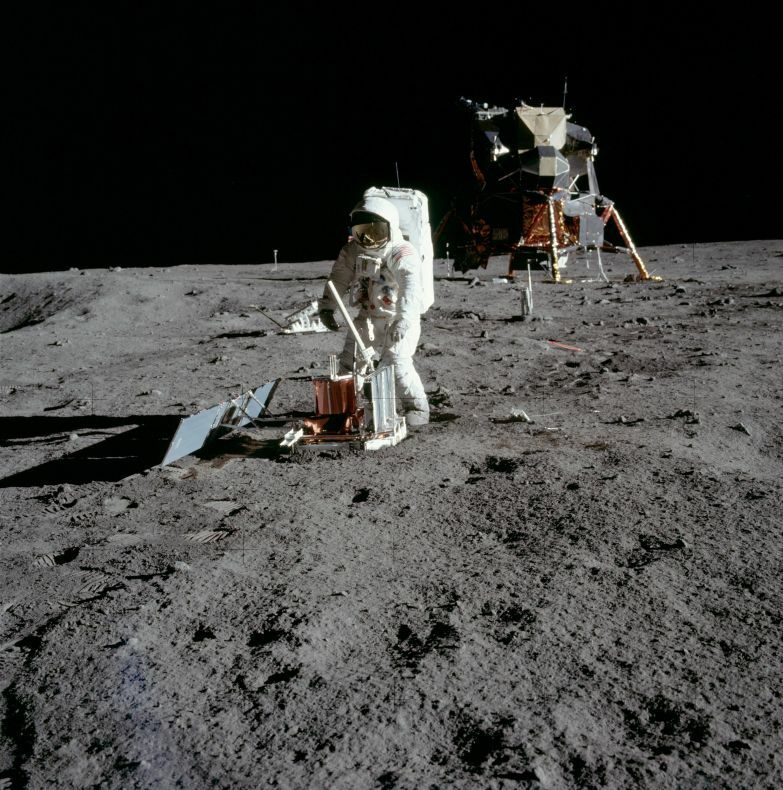 Between 1969 and 1972, Apollo astronauts placed seismometers at their landing sites around the moon. The Apollo 12, 14, 15, and 16 instruments faithfully radioed data back to Earth until they were switched off in 1977. And what did they reveal? There are at least four different kinds of moonquakes: (1) deep moonquakes about 700 km below the surface, probably caused by tides; (2) vibrations from the impact of meteorites; (3) thermal quakes caused by the expansion of the frigid crust when first illuminated by the morning sun after two weeks of deep-freeze lunar night; and (4) shallow moonquakes only 20 or 30 kilometers below the surface. The first three were generally mild and harmless. Shallow moonquakes on the other hand were doozies. Between 1972 and 1977, the Apollo seismic network saw twenty-eight of them; a few "registered up to 5.5 on the Richter scale," says Neal. A magnitude 5 quake on Earth is energetic enough to move heavy furniture and crack plaster. Furthermore, shallow moonquakes lasted a remarkably long time. Once they got going, all continued more than 10 minutes. "The moon was ringing like a bell," Neal says. On Earth, vibrations from quakes usually die away in only half a minute. The reason has to do with chemical weathering, Neal explains: "Water weakens stone, expanding the structure of different minerals. When energy propagates across such a compressible structure, it acts like a foam sponge—it deadens the vibrations." Even the biggest earthquakes stop shaking in less than 2 minutes. The moon, however, is dry, cool and mostly rigid, like a chunk of stone or iron. So moonquakes set it vibrating like a tuning fork. Even if a moonquake isn't intense, "it just keeps going and going," Neal says. And for a lunar habitat, that persistence could be more significant than a moonquake's magnitude. "Any habitat would have to be built of materials that are somewhat flexible," so no air-leaking cracks would develop. "We'd also need to know the fatigue threshold of building materials," that is, how much repeated bending and shaking they could withstand. What causes the shallow moonquakes? And where do they occur? "We're not sure," he says. "The Apollo seismometers were all in one relatively small region on the front side of the moon, so we can't pinpoint [the exact locations of these quakes]." He and his colleagues do have some good ideas, among them being the rims of large and relatively young craters that may occasionally slump. "We're especially ignorant of the lunar poles," Neal continues. That's important, because one candidate location for a lunar base is on a permanently sunlit region on the rim of Shackleton Crater at the Moon's south pole. Neal and his colleagues are developing a proposal to deploy a network of 10 to 12 seismometers around the entire moon, to gather data for at least three to five years. This kind of work is necessary, Neal believes, to find the safest spots for permanent lunar bases. And that's just the beginning, he says. Other planets may be shaking, too: "The moon is a technology test bed for establishing such networks on Mars and beyond." 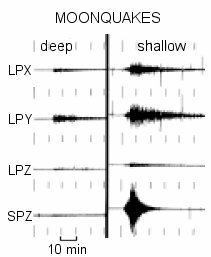 The Importance of Establishing a Global Lunar Seismic Network -- Neal's paper, presented at the October 2005 meeting of NASA's Lunar Exploration Analysis Group (LEAG). 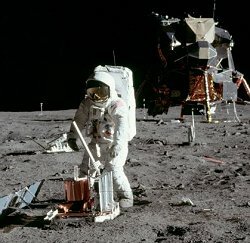 Scientists find deeper meaning for Moon rumblings -- (NY Times) more information about deep rather than shallow moonquakes. Mr. Moonquake -- Yosio Nakamura, a colleague of Neal, is a leading authority on moonquakes.